A Romantic, Pet-Friendly Bed and Breakfast Near Chincoteague Island on Virginia's Eastern Shore. Garden and Sea Inn welcomes all guests to bring their pets with them. 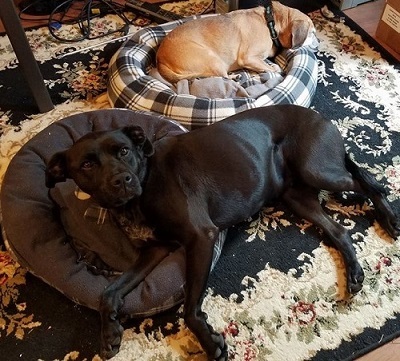 We have two dogs: a puggle named Maggie and lab mix named Bami. We only have a few rules (quiet in the rooms, leashed outside and NOT in or on the beds or furniture) which are to protect all of our Inn guests whether they have a pet with them or not. 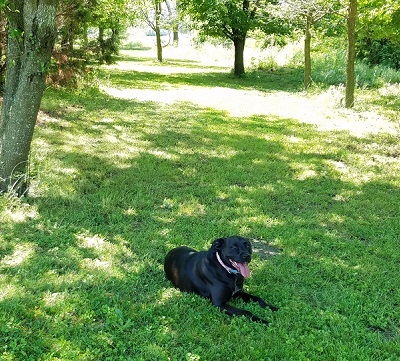 Please bring your pet, enjoy walking our mowed trails and the great pet-friendly beaches nearby! 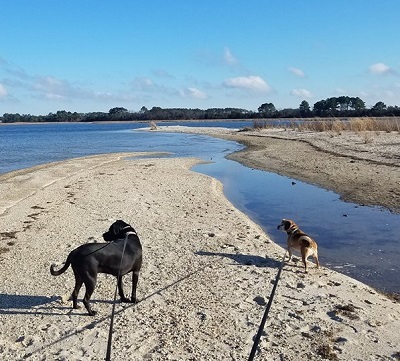 Please be advised that pets are not permitted at Chincoteague National Wildlife Refuge or Assateague Island (Virginia Side) - Not even in the car. Guard Shore Beach is just 20 minutes away on the Chesapeake Bay. This beach has quiet surf and is virtually unknown except by locals. The Maryland side of Assateague Island National Seashore (near Ocean City) is about 45 minutes away on the Atlantic Ocean. Here you can enjoy playing in the surf with your dog and watching the wild ponies all on the same day. The Inn sits on 5 acres of wonderfully landscaped gardens and natural fields where pets have room to roam. We ask that pets be kept on a leash at all times - out of respect for our other guests. There are many peaceful areas where you can sit and read or just enjoy the gardens with your best friend. We also have a walking path which circles our forest along a creek. It is fairly rustic, but the path is mowed. Pets are allowed to stay in the room without the owners being present as long as they are quiet and crated. Owners are responsible for any damages. Please note that our Merlot Room is not pet friendly to accommodate guests with allergies. Hope to See You and Your Pet Soon!